Are they trying to teach? Are they trying to persuade? Are they trying to sell something? Have things changed since the it was written? Is the info updated regularly? Can you verify the info? Has someone else reviewed the info? Are there errors in spelling or grammar? Is there a link to more info about the author? Why did they write the information? Do they have a goal or objective that might make them biased? .gov - a government organization. Often has data, standards, reports from taskforces/committees. .org - anyone can register, but traditionally advocacy group, non-profit organizations. .edu - an educational institution. Can identify expert scholars, may have links to scholarly articles. What type of website is this? Is there an "About" page? What does it tell you? Is the website owned by a person or an organization? Does the website reference any other websites or information sources? 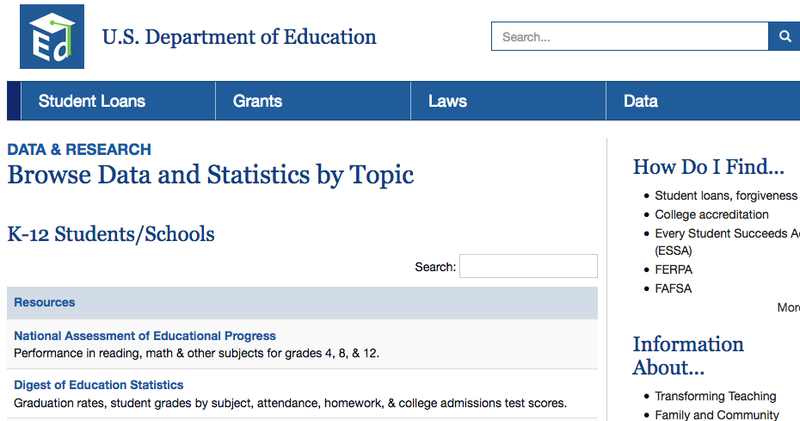 Citation: U.S. Department of Education, U.S. Department of Education, www.ed.gov. Accessed 18 Oct. 2016. Watch out for fake news sites like The Onion. These are not good sources of information. Is Wikipedia the best source of information? "Education in the United States." Wikipedia, 18 Oct. 2016, en.wikipedia.org/wiki/Education_in_the_United_States. Why did they create the image? When did they create the image? Could the data/facts have changed since then? Where did they get the data to support the information in the image? Mushlya. 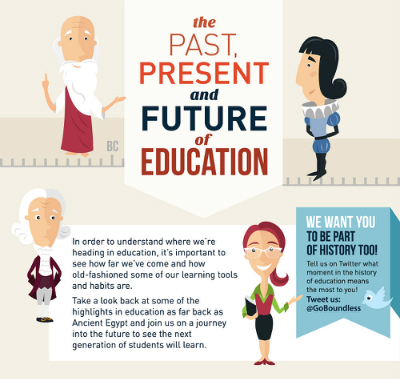 The History of Education [Infographic]. Boundless Blog, 2013, blog.boundless.com/2013/02/the-history-of-education-infographic. Accessed 18 Oct. 2016. How are articles in a web magazine / newspaper different from a website? They will typically have new posts made available, often daily. The new posts will cover different topics and often have different authors. Those authors may be journalists, freelance writers, or other contributors selected by the magazine / newspaper. Is the author credited by name? Are they a frequent contributor to the magazine/newspaper? Is the magazine/newspaper run by an organization? What is the goal of the article? To teach? To share data? To persuade? Does the publication have a bias? Does the article link to other sources of information to back up its claims? Does the article have any data in it? Where does that data come from? Lawrence, Julia. "Number of Homeschoolers Growing Nationwide." 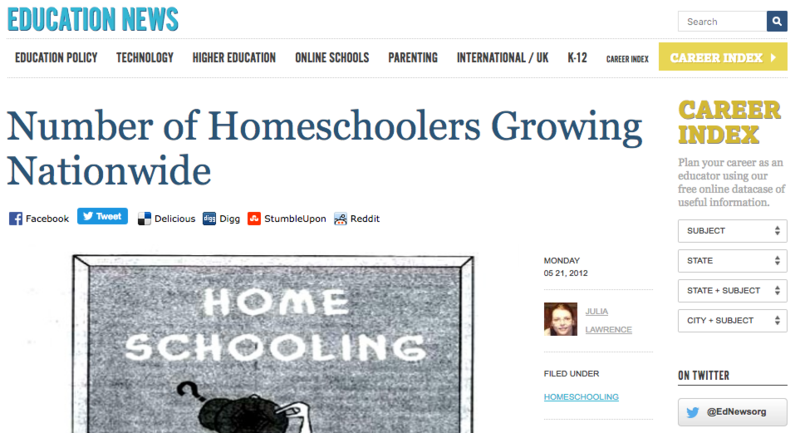 Education News, 21 May 2012, www.educationnews.org/parenting/number-of-homeschoolers-growing-nationwide. Accessed 18 Oct. 2016. Blogs can be written by anyone, so it is important to think about who the author is and what reason they have for writing their blog. Some blogs may be written by practicioners in the field, like teachers who are eager to share their experience with others. Can you verify who the author is? Is the blog sponsored by a company? Is the blog's focus relevant to your topic? Is there an "About" page? What does it tell you about the author/purpose? McGhee, Theresa. "Art Room Visuals Made Simple." The Teaching Palette, theteachingpalette.com/art-room-visuals-made-simple. Accessed 18 Oct. 2016.
Who is the author of the Tweet? Is the Twitter account verified? What is the tone of the Tweet? Is it possible that the Tweet is a joke? Is it promotional? When was the Tweet written? Is there another source of information that says the same thing? Does the Tweet point to data? Is there a link to the data? @usedgov. "Knowledge & skills in #STEM are becoming increasingly necessary for students to succeed in our global economy. pic.twitter.com/bSEBZZcN5P." Twitter, 7 Oct. 2016, 5:45 a.m., twitter.com/usedgov/status/784373969138835458. Experts and scholars sometimes create videos that offer valuable information, like the popular TedTalks series. Is there a written article that the video is based on, or that explains the topic in more depth? "The benefits of a bilingual brain - Mia Nacamulli." Youtube, uploaded by TED-Ed, 23 Jun. 2015, www.youtube.com/watch?v=MMmOLN5zBLY.